Base Damage: The standard attack damage the tower deals without any bonuses at level 0. Base Bonus: This value is added on the base damage. It is calculated into the white numbers of the tower's attack damage. Base Bonus %: After adding the Base Bonus, this percentage is added to the damage. It is also calculated in the white numbers. Bonus damage granted by oils and damage the tower gains by leveling is added to this value. Damage Add: This value is added to the towers damage after the Base Damage calculation. It will be displayed as green/red numbers behind the white numbers of the tower's damage. DPS gain by special abilities and items is usually added to this value. Damage Add %: After the Damage Add was added to the Base Damage, this percentage is added to the damage, it is also shown as green numbers. 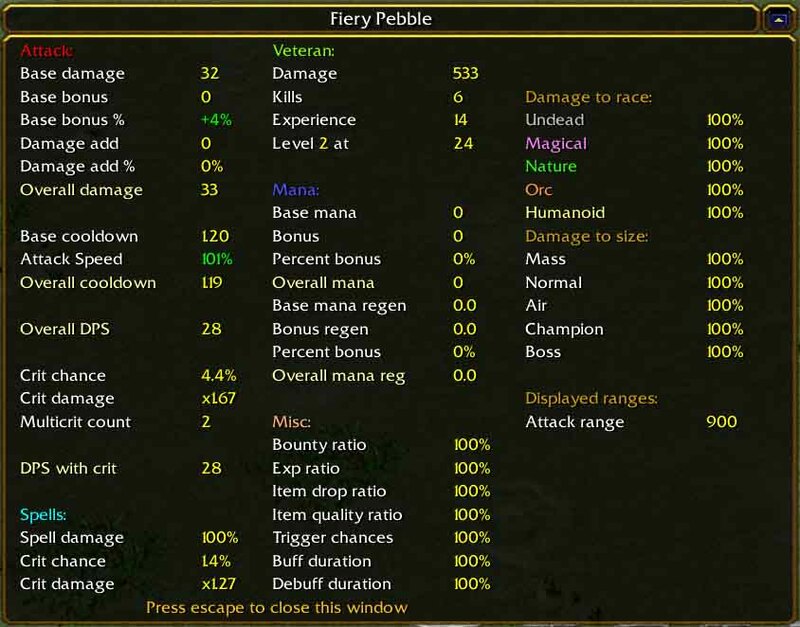 Percent bonuses from permanent items, buffs, auras and special abilities is ususally added to this value. Base Cooldown: How many the seconds the tower needs to reload without modifications. Attack Speed: The Base Cooldown is divided by this value. Towers gain some attackspeed per level and items, buffs and auras can grant attackspeed. Overall Cooldown: The result of the calculation of the Base Cooldown and the Attack Speed. This is the real rate with which the tower will attack. Example: If the Base Cooldown is 2.0 seconds and the tower has 125% attackspeed, then the real attack cooldown will be 2.0/1.25 == 1.6 seconds. Overall DPS: How much damage the tower deals with its attack per second on average (not counting in any crits). Basically, this is Overall damage / Overall Cooldown. Crit stuff: Explained in the Critical Strike chapter. DPS with Crit: How much damage the tower deals with its attack per second on average when counting attack crits and multicrits. The damage the towers deals with special abilities and spells is NOT included. Spells damage: Whenever a tower deals spelldamage, the value in its tooltip is multiplied with this value. So if a spell deals 1000 damage and the tower has 150% spelldamage the tower will deal 1500 damage with that spell. Base Mana: How much mana this tower has by default. Mana Bonus: This value is added to the Base Mana. Mana Bonus Percent: After the Mana Bonus is added, the heregiven percentage is multiplied onto the value to receive the Overall mana. Mana Regen Stuff: The same 4 values as for mana, calculated in the same way as mentioned for mana, but these values do not state the towers mana pool but how mana mana it regenerates per second. Note that also creeps have most of these values. Actual Bounty = Creep Base Bounty Value * Bounty Ratio of the killing tower * Bounty Ratio of the killed creep. So as you see the base gold you gain for a creep increases each 8 levels (after each Challenge). Each level, regardless of the creeptype, grants, if thoroughly killed, the same amount of gold. Creeps normally have a bounty ratio of 1.0, but tower or creep abilities may alter this. Actual Exp Gain = Creep Base Exp Value * Exp Ratio of the killing tower * Exp Ratio of the killed creep. Each level (except challenges, these grant double exp), regardless of the creeptype, grants, if thoroughly killed, the same amount of exp. Creeps normally have a exp ratio of 1.0, but tower or creep abilities may alter this. Item Drop Ratio: If a tower kills a creep there are x chances that an item will drop. x is dependant on the creep size. One chance for dropping an item is calculated in the following way: Actual Chance To Drop = ITEM_DROP_BASE_RATIO * Item Drop Ratio of the killing tower * Item Drop Ratio of the killed creep. Each level (except challenges, these grant double chances), regardless of the creeptype, grants, if thoroughly killed, the same amount of item drop chances. Creeps normally have an item drop ratio of 1.0, but tower or creep abilities may alter this. The constant value ITEM_DROP_BASE_RATIO is at the moment 4.75%, but it may be subject to changes in later releases. So, without any modifications, a player has 20 times a chance of 4.75% that an item will drop, if he kills a level thoroughly. Note that high values (>175%) of item drop ratio will trigger a diminishing returns, i.e. higher values will be lowered. This is to prevent lucky games where a player reaches an enormous item drop ratio. This makes him get an enormous amount of items. Since these items will again contain Oils that boost the item chance further a player would receive exponentially more and more items. This is prevented by this system. TODO: Insert example values for the diminishing returns, but i have to implement them first . Item Drop Quality: If a creep killed by this tower drops an item, the Item Drop Quality will modify the chance for getting uncommon, rare and unique items. More information about this can be found in the chapter about items. To cut long things short, here an example: 200% Item Quality Ratio will double the chance to receive an uncommon, rare and unique item. If these three chances go beyond 100%, then there will be no more common item drops and the chance for uncommons will be lowered to reach 100% again. Trigger Chances: If a tower has any percentage chance based abilities, except critical strike, the trigger chance will modify the chance to trigger these events. If your tower has for example a chance of 15% on attack to cast a spell and has 150% trigger chances, then it will actually have 15% * 150% = 22.5% chance to cast the spell. Note that some percentages are not modified by this chance, but most are. If the tower has a negative ability with a chance to trigger. Trigger Chances factor will most probably reduce this chance instead of increasing it. So let's say your tower has a 50% chance on attack to deal no damage at all. If he has 150% trigger chances, then it will actually only have a 50% / 150% = 33.3% chance to deal no damage. Buff Duration: Will increase the duration of any buff cast by this tower. So if it casts for example a buff with a 5.0 seconds duration and has 150% buff duration, then the buff will actually last 7.5 seconds. Note that if the buff is cast on a creep, the duration may be further modified by the creeps Debuff Duration value. Also note that not all, but most, buffs are modified by this value. Debuff Duration: Whenever this tower receives a negative buff (also called debuff), the duration will be shortened by the given percentage. These percentages will be included into the damage calculation of this tower's attacks and spells when he attacks a creep of the given size / race. They will be included after any other calculation. So if your tower would for example deal 1000 damage via attack or spell to a creep of Size Boss and Race Nature and has 125% damage against bosses and 125% damage against Nature, then your tower will actually deal 1000 * 1.25 * 1.25 = 1562 damage. Note that also creeps have it the other way round: They have a damage from element value. This value is 1.0 most of the time, so it can be ignored. However, creep or tower abilities may alter this value (For example Sapphirons Cold Grave does). So if the tower from the previous example is an Ice Tower and the Creep receives 150% damage from ice, then the tower will deal 1000 * 1.25 * 1.25 * 1.5 = 2343 damage. There are two different critical strikes in YouTD. Spell critical strike and "normal" attack critical strike. All tower in YouTD have at least a small chance to do these crits on attack / on casting a damage spell. Whenever a tower attacks, it has a chance (which can be looked up in the towers info panel) to hit critical. If it does its damage will be multiplied by (1 + critical strike damage). So if a tower has x0.5 critical strike damage and it crits, it will deal 1.5 == 150% of its normal damage. In addition, towers have a multicrit count. This value, which is 1 for most towers defines how often a tower can crit with a single it. A value of one means that it can critically hit once, so it's the normal behaviour of Warcraft 3 critical strikes. If this value is higher then 1, then the tower can crit up to this value often. You can see how often a tower crittet by counting the exclamation marks behind the crit message. So "4000!!!" means a tripple crit. The damage stacks additive for multicrits, that means if a tower has x0.4 crit damage and it makes a tripple crit, then it will deal (1 + 0.4 + 0.4 + 0.4 == 2.2 == 220%) damage. There are some items and buffs that add a crit in certain situations. This can add more crits than allowed through multicrit value. For example if a tower has a multicrit count of 1 and already crits on its attack, but also carries an item that adds one crit to this attack, it will double crit. Whenever a tower somehow deals spell damage (do not mix up with magic damage, magic damage is normal attack damage, so the attack crit rules apply! ), it can critically hit with it (the percentage and damage gain can be looked up in the tower info panel). The crit is calculated just like for attack crits, but spells cannot multicrit. Some spells have a modified crit ratio or damage, which will be calculated into the crit processing. If nothing is stated in the tooltip, the normal values from the tower info panel apply.